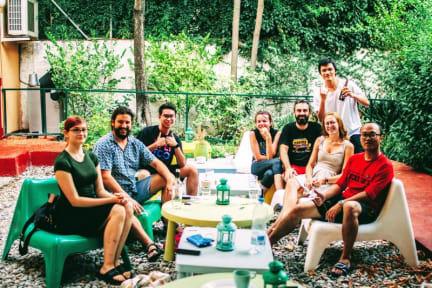 Garden House Hostel Barcelona by Feetup Hostels i Barcelona, Spania: Bestill nå! For travellers looking to immerse themselves in the local lifestyle, Feetup Hostels-Garden House Hostel is a great place to start. Hostelworld guests tell us that this hostel is not `for people who come to Barcelona to do pure party, but for chilled-out travellers´. This hostel is located in a residential area near Valldaura metro station (Line 3), going direct to Passeig de Gràcia and Parallel metro station. It gets very high ratings from our users, particularly for their multilingual staff. We've noticed that many reviewers assure that they would stay here again. In Garden House Hostel Barcelona by Feetup Hostels built in the beginning of the 20th century, you will find a warm and friendly environment. You will be served by nice, experienced and multilanguage staff, who can provide you with useful information and advices during your trip. Please note that our hostel is located in a very quiet area and we would like to keep its calmness. In Barcelona you can find parties everywhere, therefore our hostel is a precious oasis of peace, where you can have a rest when you would like to get out of everyday rush or after spending a long day discovering our beautiful city. We offer you a fully equipped kitchen, where you can cook everything you want; a common area, where you can read in quiet; the garden, where you can drink a glass of wine and hang out with other guests; the terrace with sun beds for sunbathing; and last but not list the comfortable rooms where you can relax at the end of the day and sleep well. If you want you can buy buffet breakfast at our reception only 3€- It includes: Juice, cocoa, coffe, milk, cereals, toast, sweet ham, cheese, croissant, muffin, jam, butter, seasonal fruit. We get more travellers than tourists here, probably because all the areas of the hostel are perfect for meeting the rest of the guests. There's a great terrace and garden where we have barbecues and just relax together. It's a nice environment.